It’s no secret I’m a high-heel-oholic but even I need flats sometimes. The key for me is that they are supportive enough; completely flat ballet pumps just leave me with sore feet after pounding the pavements with a pushchair on the school run and back. I’ve featured ShoeTherapy before on cocomamastyle.com because not only are they comfortable and designed to support and cushion in all the right places, they are infinitely more stylish than any other ‘practical’ shoe! ShoeTherapy have now added loafers to their offering so if you fancy a change from ballerina style pumps or your regular flat-soled loafers aren’t cutting the mustard when it comes to comfort, you can don a (tasseled! *) pair to update your everyday style. Update denim with a cropped flare and wear with quilted leather and a simple shell top. Use embellishment to add a laidback luxe look to an all grey outfit with a merino sweater and relaxed fit trousers. Bring your leather (and faux leather) up-to-date with oxblood tones and pair with grey marl. Soften eyelet hardware and leather with a chunky knit for a dressed-down monochrome look. More oxblood but this time in a high waist jegging to hold it all in and create a smooth line under fitted tops. Add a printed blazer (winter florals would also work) to finish the outfit. Bring some brights into the weekend with a pop of pink contrasting with black. 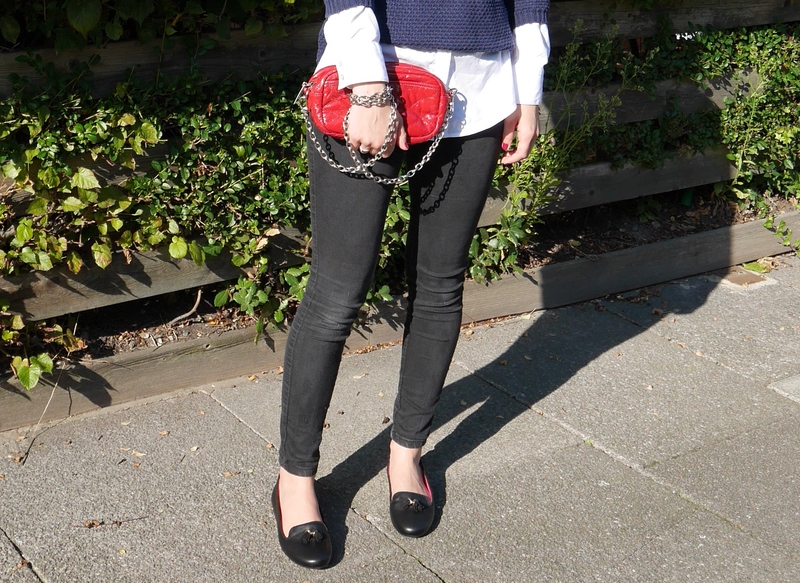 Layer a chunky cropped knit over your trusty white shirt and simple skinnies to smarten up your Sunday style.